We (Jason and Jess) are the co-founders of Untitled Folder, LLC, a software development and consulting agency based out of Philadelphia. We help early-stage startups on their journey from an Untitled Folder of ideas to building a scalable Minimal Viable Product (MVP). 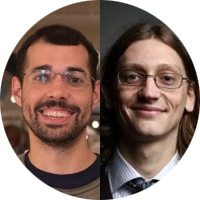 In our spare time, we run a meetup called Philly GraphDB where we explore graph database technologies and share what we’ve learned with the community. While working with open city data in Neo4j, Jason and I discovered there was a lot of open public data freely available to anyone. Our goal then switched to how we could utilize this data to its fullest potential. Having seen the impact software engineers, data scientists and journalists could have with data – like that of the Paradise and Panama Papers – we were inspired. One afternoon, while preparing open data examples for our investigative journalism meetup, hosting Will Lyon from Neo4j, we conceived the foundations for the Cypher Philly initiative. The initiative instantly gained support when we pitched our idea for the initiative at the end of the meetup. We also grew our team after bringing on our friend, Marieke Jackson, an expert data scientist who’s passionate about using civic data to build scrollytelling stories. 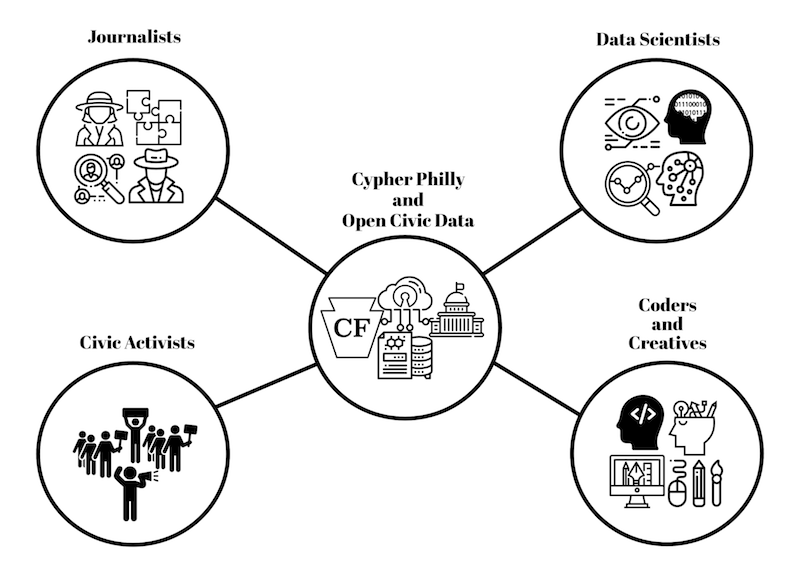 Cypher Philly is an open source project designed to empower citizens, journalists, data scientists, coders and creatives with the ability to harness open data for civic good. Our goal is to simplify the process of telling data-driven stories using open public data to bring about actionable change, while also informing citizens and governments alike. The Cypher Philly team has been growing and collaborating with various organizations, groups and communities to build and expand our reach. To help us grow, we’ve gained local sponsorship from Linode to cloud host all of our related civic app projects. We also picked up Azavea as a sponsor to host our meetups in their offices, as well as lend support in building geospatial models of our data. We also gained support from the Code for Philly and Code for America communities to expand our reach and expose the project to more people who want to contribute. Additionally, we gained support from the Philadelphia Design Activists community, the Committee of Seventy organization and various journalistic groups. The Cypher Philly team and participants have access to a collection of digital tools and methods we’ve built for finding, scraping, importing and storing data for civic-related projects using open public data. These tools and methods are freely available from our open source GitHub repository and may be used by any group or individual. We meet frequently with different participants in smaller groups based on their skill sets and interest in participation. In our meetings, we discuss our goals and tasks for contributing to the projects we’re currently working on. All participants can see, in real time, what tasks are available for contribution. Our project tasks and GitHub issues – available for anyone to assign themselves to an issue and work on that issue on their own time – live at the Untitled Folder Projects Board. Collaboratively, we contribute to completing a data story that our city/state’s Cypher team deems most relevant in addressing the major civic issues we face. Currently, Cypher Philly is working to address PA gerrymandering and how citizens are represented by district. Linode is a Gold Sponsor of GraphConnect 2018. Use code LIN20 to get 20% off your ticket to the conference and training sessions, and we’ll see you in New York! Meet graph experts from around the globe working on projects just like this one when you attend GraphConnect 2018 on September 20-21. Grab the discount code above and get your ticket today. Jess Mason is a Co-Founder and Chief Operating Officer at Untitled Folder, LLC, as well as the Founder and CEO at Addictive Science, LLC. Jess is also a Neo4j Philadelphia Community Organizer & Meetup Event Host/Coordinator for the Philly Graph DB meetup group. Jason Cox is a Co-Founder and CTO of Untitled Folder, LLC, as well as a full-stack software engineer that helps clients determine what it is to build, design, develop, maintain, host, etc. Jason currently specializes in using responsive design to build one set of code that can be launched for desktop web, mobile web and native (hybrid) apps on Android, iPhone, Windows Mobile, Mac, Ubuntu and Windows.